The Chelsea Physic Garden, founded in London in 1673 as the "Garden of the Society of Apothecaries" and originally situated at Westminster. The plants at Westminster were moved to Chelsea in 1676. The garden in Oxford, founded by Henry Danvers, 1st Earl of Danby, with Jacob Bobart the Elder as Superintendent, dates to 1632. 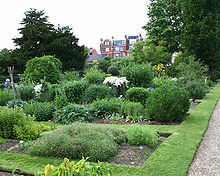 Begun in Westminster and later moved to Chelsea, the Apothecaries founded the Chelsea Physic Garden in 1673, of which Philip Miller, author of The Gardeners Dictionary, was the most notable Director. By 1676, the position of "Keeper of the Physic Garden" was held by the Professor of Botany at the University of Edinburgh. Provand's Lordship - the physic garden in Glasgow. ^ a b American Medical Association; HighWire Press (10 July 1915). "A History of Botanic Gardens". JAMA: The Journal of the American Medical Association (Public domain ed.). American Medical Association. 65 (2): 170–. doi:10.1001/jama.1915.02580020036016. Retrieved 7 January 2012. ^ a b Hill, Arthur W. (February–April 1915). "The History and Functions of Botanic Gardens". Annals of the Missouri Botanical Garden (Public domain ed.). 2 (1/2): 188, 203. doi:10.2307/2990033. JSTOR 2990033. ^ a b Holmes, Edward M. (1906). "Horticulture in Relation to Medicine". Journal of the Royal Horticultural Society (Public domain ed.). 31: 42, 50, 54.